In addition to our summer camps, we provide one-day camp programs that we affectionately refer to as “Horse for a Day.” During a “Horse for a Day” the primary activity is riding lessons while students also learn about all aspects of horsemanship from safety, leading a horse, grooming, saddling, feeding, caring for horses, and more. We often include arts and crafts, grooming contests, and fun horse learning activities. This fun, interactive day is perfect for a horse lover with a day off from school. We limit the size of our program to 10 children to ensure individual attention to each student. Horse for a Days are perfect for beginner riders looking for more equine education and advanced riders seeking more time in the barn and in the saddle. We divide groups appropriately by age and ability and do our best to make sure each student has a chance to ride his or her favorite horse. 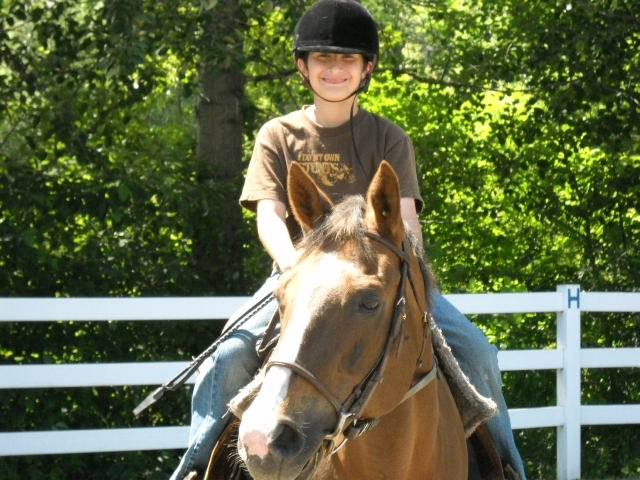 The cost is only $100 for two riding lessons and a day of fun learning at the farm. Students should come dressed to ride (riding boots and long pants) and must bring a water bottle and their own lunch. During the colder months, we offer hot chocolate and popcorn. We also keep a water cooler in the viewing room for thirsty riders. All of our horse camps include a short bible study/prayer devotion time to start the day. Our programs start at 9:00 am and end at 3:30 pm. Typically, we offer Horse for a Day programs during the school year when students have a day off. We traditionally offer Horse for a Days during breaks for Thanksgiving, Christmas, New Years, Presidents Day, Martin Luther King Junior Day, Easter, NEOEA Day and more. Check back frequently for upcoming programs or contact us. 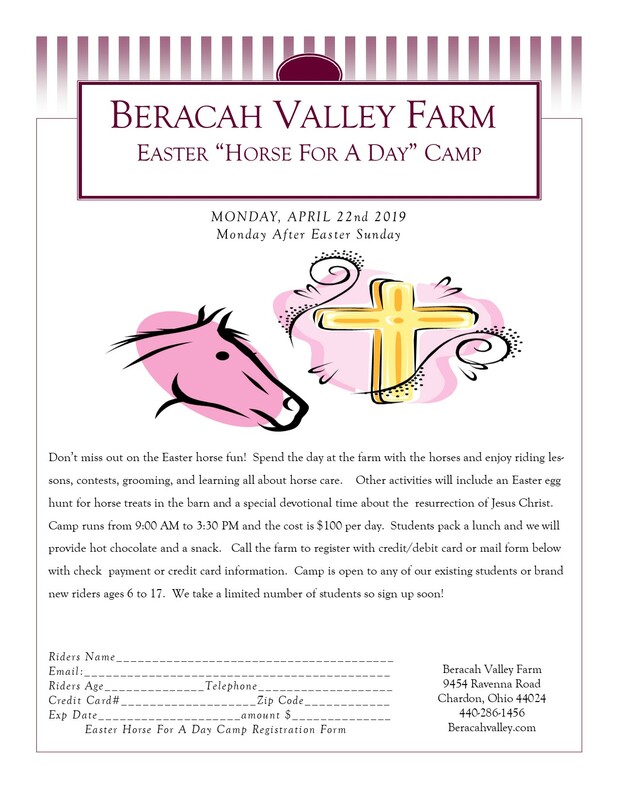 Our last one day camp for the 2018/2019 school year is the favorite Monday after Easter!